Offering you a complete choice of products which include printed grocery bags. Depth 5.5 to 18 cms. Height 18 to 48 cms. Width 10 to 40 cms. These are without gusset bags. Can be made Plain or With Printing upto Two colours. 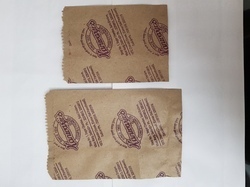 Paper used is of Indian Mills Kraft of Grammage 80 to 120 depending upon the size of the bag or Customer's Specification.Size of the bag can be from 250 gm. capacity to 5.0 kg.